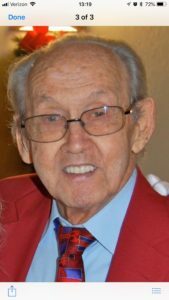 Ray Jean Batts of Frankfort, Indiana went to be with the Lord on September 15, 2018 at E.T. York Hospice, Gainesville, FL. Curtis (Amanda) Romey of Bartow, FL and Valerie Romey of Gainesville, FL along with eight great grandchildren and a host of nieces and nephews. Memorial gifts may be given to the First Church of the Nazarene or by donating blood to the American Red Cross. Arrangements are under the care of Forest Meadows Funeral Home, Gainesville, Fl. Sending love to you during this time of grief. May the love of family and friends sustain you now as you have always done for others. Prayers and thoughts to you all! The love this man showed me while growing up is forever ingrained in me. I think of him often, we need more neighbors in the world like him. I know him and my mom are catching up.